No matter if it is a a trip through the Dutch landscape, or you are going to climb the Himalayas with full luggage, it is very important to go on your way well prepared. Step 1: Go on your trip with the right type of bike. Jan Brinkman would like to advise you on which one would be best for which trip. A travel bike is mainly different from mountain bikes and racing bicycles for its stiffness, the strong luggage carriers, and their strong wheels. On top of that, they don’t wear so fast. Everywhere in the Netherlands, and on many travel destinations, it is possible to rent bikes. However, a lot of times rental bikes are in a bad condition and are too small or too big. Of course this is no problem when you just go out for one day. But when you are planning to go for multiple days and for many kilometers, this becomes a problem. We are very aware of that. Of course we don’t just rent bicycles. We also rent front bags, rear bags, handle-bar bags, and helmets. When you enjoyed your bicycle for a 100%, it is also possible to buy the bike afterwards. All our rental bikes have to reach the same high requirements as if you would buy a bike. High requirements regarding reliability, and to bring you from A to B without any problems. “Tubes” bag carriers, both front and rear. Combi SPD pedals from Shimano. So you can either use SPD shoes and normal ones. When the bike is picked up from the store we will perform a sq-lab seat measuring. With this we can supply you with the best seat. When you prefer to have it delivered, we will use the most common one. The Cube bikes are equipped with a hub dynamo. The Santos bikes have no lighting. A compass bell. You will use this more than expected! Ergon handlebars, these decrease possible tingle in your hands. Zefal frame rear-mirror, so you will see traffic coming from the back. The Santos Travelmaster will be fully adjusted to your sizes and is available with Rohloff Speedhub, belt-driven, and equipped with hydraulic brakes. The travel bikes of this brand stand for pure quality. Jan Brinkman (Who rides a Santos himself), would be glad to advise you on the possible purchase of a travelbike. If you have any further questions, don’t hesitate to contact us. Cycling with luggage requires some attention. Therefore, we advise to make a trip of about 15 to 25 kilometers before your departure to feel if the weight distribution is correct. To feel if it is in balance, you can try to very careful loosen your grip on your handlebars. If your bike will pull to the left or the right, the weight distribution is out of balance. Try to reorganize your luggage until it is somewhat possible to bike without using your hands. 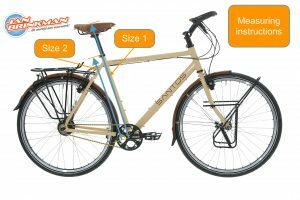 If you liked your bike so much you want to buy a similar new one, 50% of the renting price will be deducted from the price of buying a new vacation bike (Koga, Santos, Jan Jansen). There is not way to test a vacation bike better than this. Prices are including VAT and a helmet. Bikes are equipped with combi-SPD pedals, Tubus luggage carriers front and back. 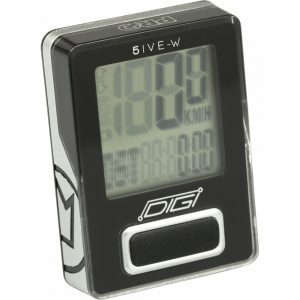 Possibility to buy a cycle computer for € 22.50,- including installation. Extra lock (Abus Bordo Light folding lock) for € 15,- per rental period. The deposit and the rent have to be paid before the renting period. A valid ID-card, driver’s license, or passport has to be shown when picking up the bikes. It is possible to have your bike delivered at any point in the Netherlands (Islands excluded). The costs are € 0.50 per kilometer from the store’s address to the destination and back calculated using Google Maps. For example: Dronten – Schiphol Airport – Dronten is 170km so € 85,-. In order to experience maximum comfort during your trip it is possible to have a bodyscan performed. This means we will measure all your relevant sizes in order to adjust the bike to your body as much as possible. Especially for longer trips we strongly recommend the bodyscan in an attempt to avoid physical problems during your vacation. The costs for a body scan are € 35,-. One of the most important details we would like to know about you is the size of the bike you would prefer to rent. We can adjust many settings on the bike except the size of the frame. That why we would like to know size 1 and 2 of your own bike (if that bike fits you well) at the time of reservation. If you have any doubts about which size would be right for you, visit our store for a body scan. (if this is impossible for you we could send more detailed measuring instructions). You are personally liable for any damages or theft of the rental bike. Therefore, we recommend the purchase of a good travel insurance. Please check the conditions of your current insurance for coverage. For extra security of the bike during the rental period, it is possible to rent an extra lock. For the full rental period the costs are € 15,-. There is also a possibility to have a bike computer installed on the travel bike. This can be a handy tool for following the planned route. The costs are € 22.50 and after the rental the computer is yours. vacation bike better than this. Click here to make a reservation for your travel bike. When creating the rental agreement, you automatically agree with the terms and policies set by the overarching foundation for the cycling industry. The terms and conditions can be downloaded here but are unfortunately currently only available in Dutch.